New cartoon - Where do you want to go today? Last Monday I launched a new webcomic about web developer jokes. It's called comic.browserling.com. It's been a lot of fun. The cartoons are getting really popular and are being viewed thousands of times. Today, I just added a new cartoon called Where do you want to go today? I'll be adding one new cartoon every week. All cartoons are licensed under the CC BY-NC licence. You can share, remix, transform, copy, link to, redistribute cartoons and jokes but you can't sell them. If you like these cartoons, please subscribe to webcomic updates and follow me and @browserling on Twitter! 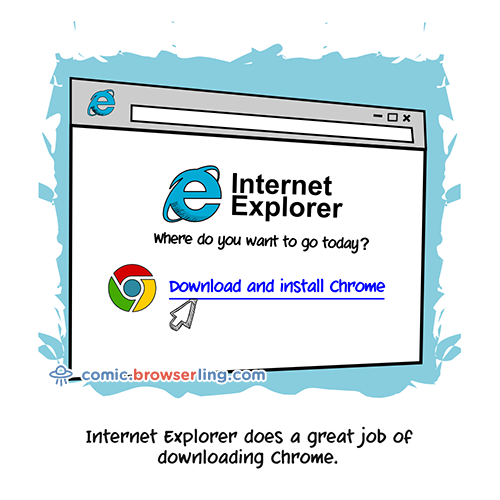 This blog post is a repost of A new webdev cartoon: Internet Explorer on Browserling's cross-browser testing blog.